Dental biomaterials are biological or synthetic products typically used for the restoration of tooh supporting structures such as bones and soft tissues and periodontal structures in dentistry. Bone graft materials, membranes, and soft tissue regeneration products are the most commonly used biomaterials for oral regeneration procedures. A rise in the elderly patient pool with missing teeth and an increase in the number of implant procedures across the globe have led to high demand for bone graft materials. 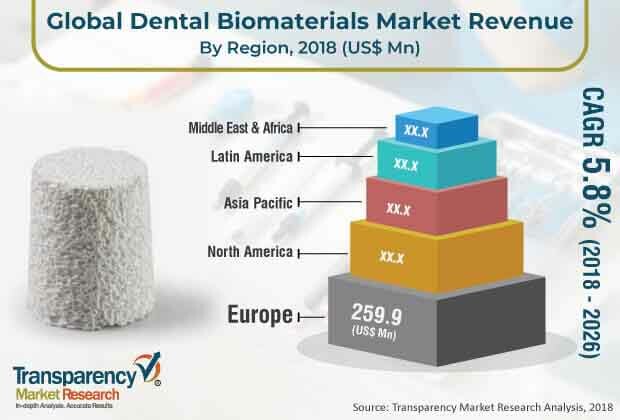 An increase in the prevalence of oral diseases and increase in dental tourism in developing countries are expected to boost the dental biomaterials market in the next few years. The global dental biomaterials market was valued over US$ 600.0 Mn in 2017 and is projected to expand at a CAGR of 5.8% from 2018 to 2026. The global dental biomaterials market has been segmented based on product, application, end-user, and region. In terms of product, the global market has been classified into bone graft materials, dental membranes, and soft tissue regeneration products. The bone graft materials segment is anticipated to account for a leading share of the global market during the forecast period, owing to an increase in the usage of allografts, xenografts, and synthetic grafts in the treatment of periodontal defects. Based on application, the global dental biomaterials market has been categorized into implantology, periodontology, and others. The implantology segment held a prominent share of the global market in 2017, owing to a rise in implant procedures across the globe. In terms of end-user, the global market has been bifurcated into hospitals and dental clinics. The dental clinics segment is expected to account for a significant share of the global market in the coming years. In terms of region, the global dental biomaterials market has been segmented into North America, Europe, Asia Pacific, Latin America, and Middle East & Africa. Europe accounted for a major share of the global market in 2017, owing to the presence of well-established players offering dental bone graft substitutes and higher penetration of dental implants in the region. The U.S. is anticipated to account for a significant share of the global market between 2018 and 2026, owing to an increase in the edentulous geriatric population in the country. For instance, according to the American College of Prosthodontists (ACP), currently, 23 million people in the U.S. are completely edentulous and another 12 million are edentulous in one arch. This is expected to drive the market in North America. The market in Asia Pacific is likely to expand at a significant CAGR during the forecast period. Increase in the geriatric population with missing teeth in emerging countries and a rise in demand for esthetics leading to higher adoption of dental implants are projected to propel the dental biomaterials market in the region. For instance, according to the Indian Dental Association (IDA), currently, about 30% of adults aged 65 years and older in India are edentulous, compared to 46% 20 years ago. These factors are anticipated to drive the market in the region in the next few years. Key players operating in the global dental biomaterials market include Danaher Corporation (Nobel Biocare Services AG), Geistlich Pharma AG, Institut Straumann AG, 3M, BioHorizons IPH, Inc., Dentsply Sirona, and Biomatlante. These companies have a broad product portfolio of dental biomaterials and focus on innovative product launches in order to strengthen their market position. The global dental biomaterials market report comprises an elaborate executive summary, which includes a snapshot that provides information about various segments of the market. It also provides information and data analysis of the global market with respect to segments based on product, application, end-user, and region. A detailed qualitative analysis of drivers and restraints of the market and opportunities has been provided in the overview section. Additionally, the section comprises a competitive matrix and company profiles with product portfolios to understand the competitive landscape in the market. This section of the report also provides market attractiveness analysis by region and market share analysis by key players, thereby presenting a thorough analysis of the overall competitive scenario in the global dental biomaterials market. The global dental biomaterials market has been segmented based on product, application, end-user, and region. In terms of product, the global market has been classified into bone graft materials, dental membranes, and soft tissue regeneration. The bone graft materials segment has been further segmented into allografts, xenografts, and synthetic. Based on application, the global dental biomaterials market has been categorized into implantology, periodontology, and others. In terms of end-user, the global market has been divided into hospitals and dental clinics. The market size and forecast for each of these segments have been provided for the period from 2016 to 2026, along with their respective CAGRs for the forecast period from 2018 to 2026, considering 2017 as the base year. The global dental biomaterials market has been segmented into five major regions: North America (the U.S. and Canada), Europe (the U.K., Germany, France, Spain, Italy, and Rest of Europe), Asia Pacific (India, China, Japan, Australia & New Zealand, South Korea, and Rest of Asia Pacific), Latin America (Brazil, Mexico, and Rest of Latin America), and Middle East & Africa (GCC Countries, South Africa, and Rest of Middle East & Africa). The market size and forecast for each of these regions and countries/sub-regions have been provided for the period from 2016 to 2026, along with their respective CAGRs for the forecast period from 2018 to 2026, considering 2017 as the base year. The research study also covers the competitive scenario in these regions. The report also profiles major players in the global dental biomaterials market based on various attributes such as company overview, financial overview, product portfolio, business strategies, and recent developments. Major companies profiled in the report are Institut Straumann AG, 3M, Geistlich Pharma AG, Dentsply Sirona, Danaher Corporation (Nobel Biocare Services AG), Zimmer Biomet, Biomatlante, BioHorizons IPH, Inc., and ACE Surgical Supply Company, Inc.